Any clue how to get the discount? The sites do not automatically include it. The links will lead to the sales once they start. None of them have yet. The first ones start tomorrow and some after that. I posted the valid dates for each sale. And the FTDNA starts on 4/20, it's 4/20 on the EST, where I am located. Yes, AncestryDNA said their sale would start on the 19th in the emails they sent about it but for some reason, it did not. FTDNA's sale will start sometime in the morning Central time. Thanks! Ancestry is brutal in trying to get them to accept any discount. It's still coming up as full price. And their service for the DNA has went down the tubes...no pun intended. 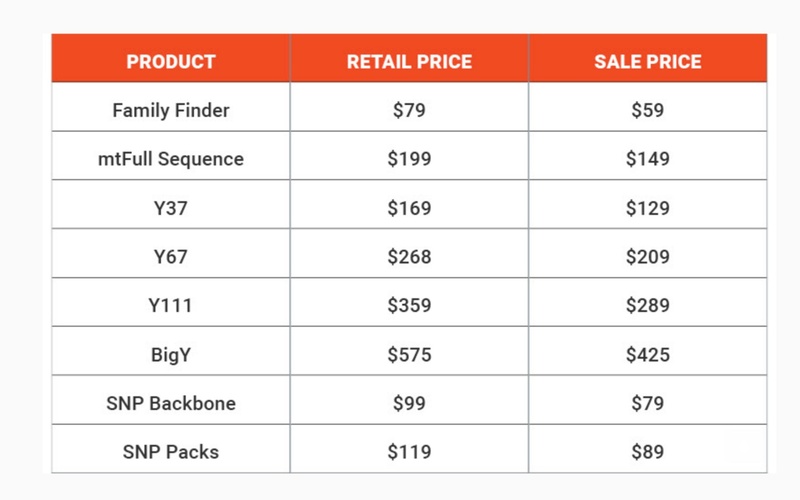 FTDNA went right through a their sale price. Thank you, FTDNA! The program that handles AncestryDNA's promotions sent an erroneous email saying it was starting yesterday. It has now been updated to the 21st, so it doesn't start until tomorrow. Sorry about the confusion! FTDNA = Family Tree DNA - their sale has started! If I have already taken the Ancestry Autosomal DNA test, and I am female, what is the next test I should consider? Have you transferred your data to FamilyTreeDNA.com, MyHeritage.com & GEDMatch.com? If not, that should be the first thing to do. Each database has different pool of testers, so transferring your data gives you matches that don't show up on Ancestry. For your next test, either take a 23andme autosomal test (to get your data in ALL of the current databases) or a mitochondrial DNA test from FamilyTreeDNA (the only place currently to take it (see http://www.legalgenealogist.com/2017/04/20/dna-day-sales-for-2017/). I have uploaded to all of the above. I will take a look at the 23andme and FTDNA mitochondrial test. THANK YOU! Really appreciate this blog and the info. I a female with a male twin--so we are fraternal twins. I have done the Ancestry DNA for both of us. I am thinking I would like to do the FT DNA mitochondrial kit and my brother the Y-67. Do we have to both have the Family Finder for each separate sequence? 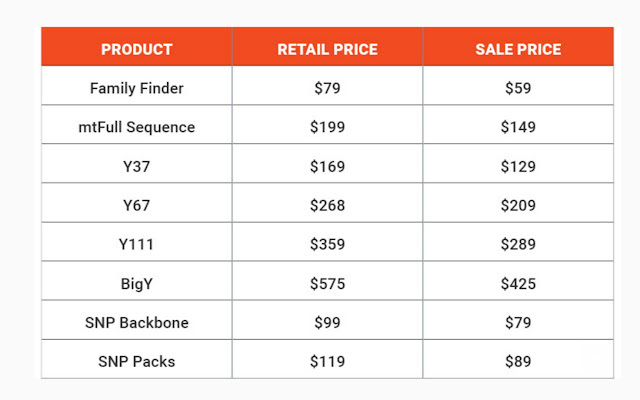 If I do the Full Sequence kits which has one Family Finder, MtDNA and Y-67 test I will save money ($417.00). But wonder if I need to do the Family Finder for each of us or does that full test mea comprehensive for only ONE person? I wanted your opinion since the person in customer service may not have a true understanding. If you have tested at AncestryDNA, then you can upload both of your raw data files from AncestryDNA to FTDNA's Family Finder database for free ($19 for premium features). I would definitely go with the Y-67 for your brother. The mtDNA is less of a priority for genealogy purposes, but if you want to do it, then do the full sequence to have the best chance of getting something out of it. You have to have two separate accounts, so you couldn't use the mtDNA for you and the Y-67 for him, but since he has the same mtDNA, he could just do that test too. I don't think you need to purchase the Family Finder though because of the upload option. Good luck! Thank you for the input. I really appreciate you answering back. I did my homework and found that you did say the mtDNA did not really help with genealogy so much...so thank you for saying it for anyone else in my boat. I ordered the y-dna for my male twin. I appreciate your saying I need 2 separate accounts. I was interested in 23 and Me. They don't mention a sale, but when I started to order a $20 discount was applied for Mother's Day. I was just adding their sale to the post. Glad you got it! The 23 and Me site is in Great Britain and there does not seem to be a way to order in the U.S. Help!